Route 66 in New Mexico, by Kathy Weiser-Alexander. Route 66 does not end along 6th Street in Amarillo, Texas, Kathy Weiser-Alexander. Running through the states of Illinois, Missouri, Kansas, Oklahoma, Texas, New Mexico, Arizona, and California, the highway became one of the most famous roads in America. 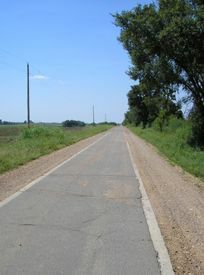 For decades, this historic path served thousands who were migrating west, especially during the Dust Bowl of the 1930s. 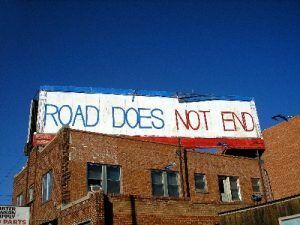 Over the years, the road underwent many improvements and realignments, changing its path and overall length, and moving its endpoint farther west to Santa Monica, California. Route 66 was officially decommissioned in 1985 and the familiar highway markers came down. But, it was not the end for this historic path. New generations wanted to travel this old road, signs began to go back up, and today, thousands enjoy these vintage peeks along the old highway. However, the original road is not indicated on most maps today, and this portion of Legends‘ website provides descriptions of the many towns, sites, and icons of the Mother Road, as well as additional articles and the Route 66 Emporium for those looking for books & maps, postcards, souvenirs, and memorabilia. Route 66, produced by Kathy Weiser-Alexander. …and they come into 66 from the tributary side roads from the wagon tracks and the rutted country roads, 66 is the mother road, the road of flight. 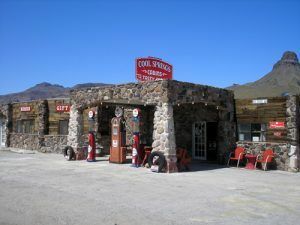 About Route 66 – History and Information about the Mother Road. Mile By Mile Westbound: This very detailed section includes hundreds of pages of the many small towns along the mother road, “must see” sites, and bucket loads of photographs. View all our Route 66 Photo Galleries HERE!